Hey there! 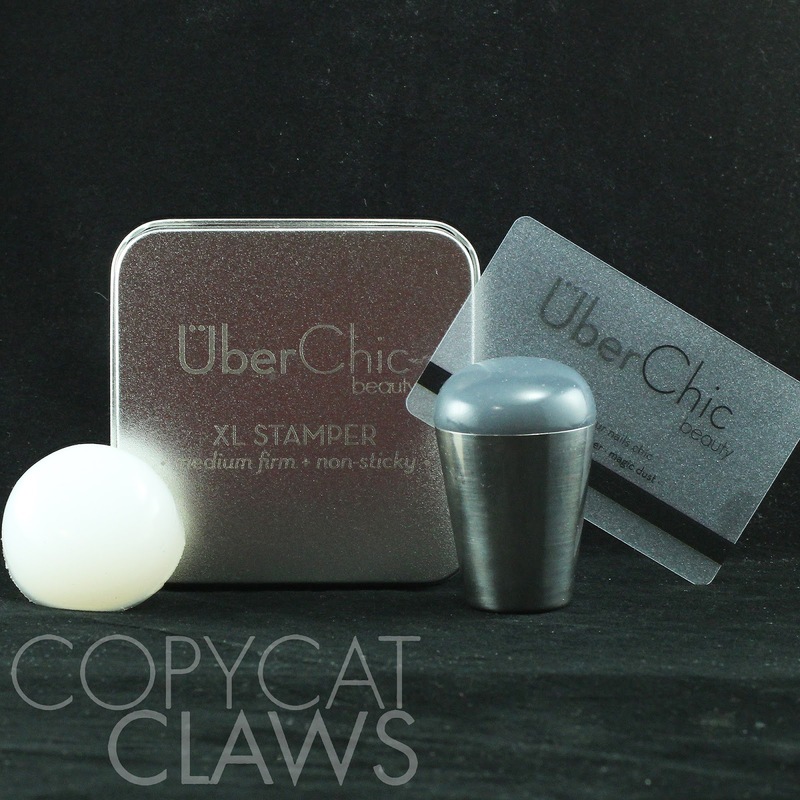 I'm on the neverending hunt for the perfect stamper so when I heard that UberChic Beauty was going to release some stampers and asked if I'd like to try them, I was over the moon! I was sent two sets of stampers - one non-sticky with medium firmness and one soft and sticky stamper. Mine each came in these handy little tins (more on that later) but it's just not a single stamper in that tin. Keep reading to see what comes with these stampers. Each of the stampers I was sent for review came as you can see below - 2 stamper heads (one white and one dark grey), an interchangeable holder for the stamping heads and a scraping card. Due to manufacturer difficulties, the tins you see in my post are limited edition until they sell out. 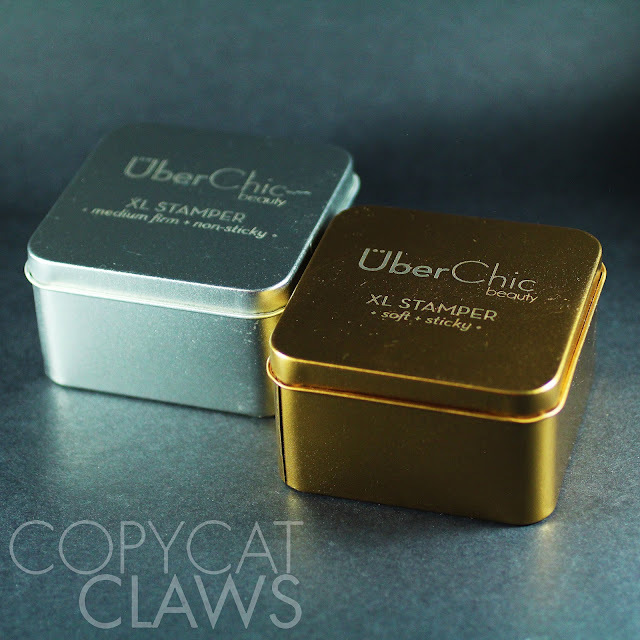 If you'd like a stamper with a tin, it will cost $1 extra. 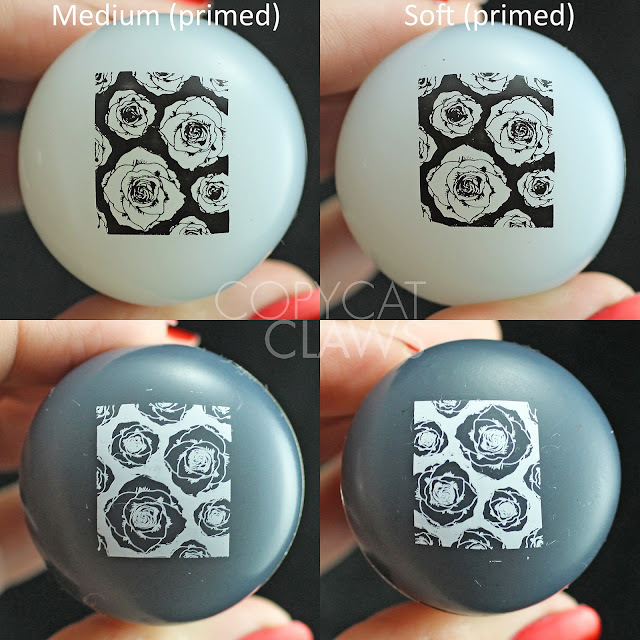 There are also a couple other recently released stampers that you can find here. I don't have a review for them but their descriptions should help you decide if they're what you're looking for. I've never reviewed a stamper before so I thought the first thing I'd do is look at its size. The stamper heads have a diameter of just over 4 cm when outside of the holder and 3.6 cm when inserted into the holder. They are about the same size as the Creative Shop Stamper and significantly larger than the FabUrNails XL or Konad stampers. Secondly, I wanted to show how soft the stamper heads are so I tried photographing each stamper while pressing them with approximately equal pressure. 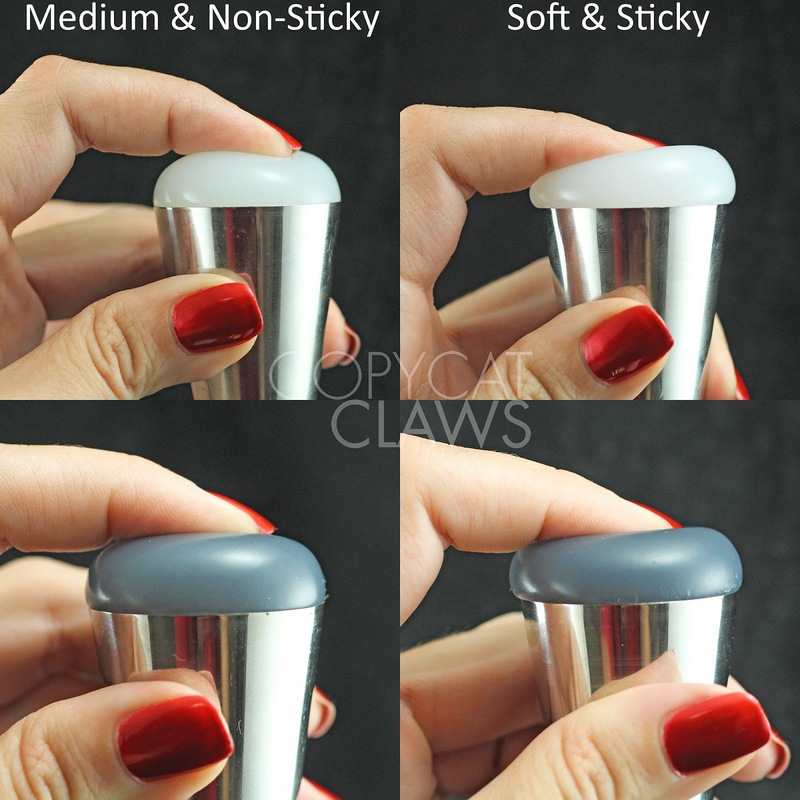 The Medium stamper isn't very squishy but is soft enough that you don't need to roll the stamper to apply the image to the nail. The Soft stamper is very squishy. In both stamper sets, the dark coloured stamper felt slightly more firm than the white counterparts. 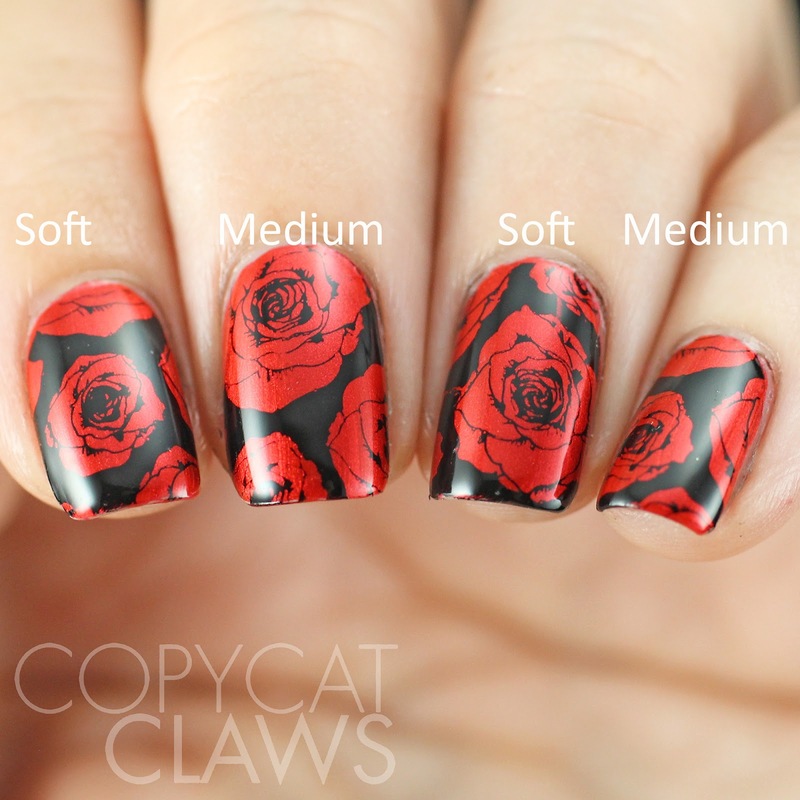 In case you want a comparison, here's the same thing with the Creative Shop Stamper and the Fab Ur Nails XL stampers. The UC Medium stampers are approximatley equally squishy to Creative Shop and the UC Soft stampers are more in line with the FUN XL stampers. Now for the important part...how do they stamp? I'll preface this section by stating that I could tell straight off the bat that these stampers would need some priming. 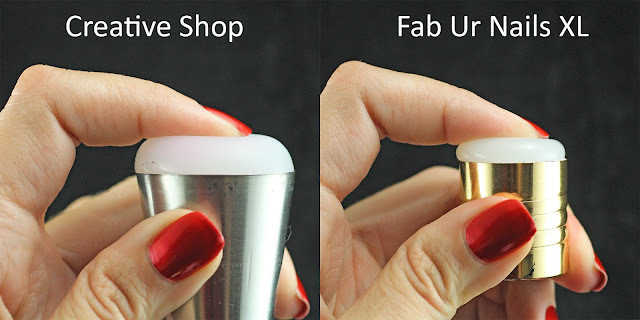 I believe that when these silicone stampers are made that an oil is included in the process that, while it helps remove the heads from the molds used, can definitely interfere with the stampers ability to work out of the box. These stamper heads came quite oily. Here is how they picked up UNPRIMED, straight out of the packaging. Needs a bit of work. Luckily, removing these oils really isn't very difficult. I've heard people roughing up the heads with a Mr. Clean Magic Eraser but I've never been clear on how much/how hard to do it. What I did here was wash them all once in my hands with a bit of regular dish soap (which would emulsify the oils). I dab them dry and then give them a few swipes with a cotton pad and pure acetone (since acetone is a solvent and a drying agent). That being said, don't make acetone your regular cleaner of choice for your stampers. Just use a lint roller or tape for regular cleaning and only wipe with acetone if a stamper has become problematic otherwise the acetone will eventually start breaking down the silicone. Below is a photo of how the image picked up after priming as above. I picked an image with very fine detail and with large open spaces to see how the stampers dealt with both types of images. After scraping, I picked up the image by lightly rolling on the plate and then applied the images to the nails by pressing on (not rolling). 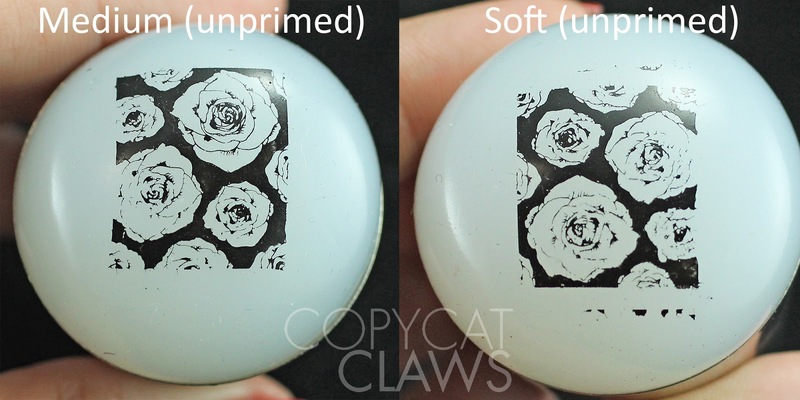 I think both types of stampers do a stellar job of picking up images after priming. 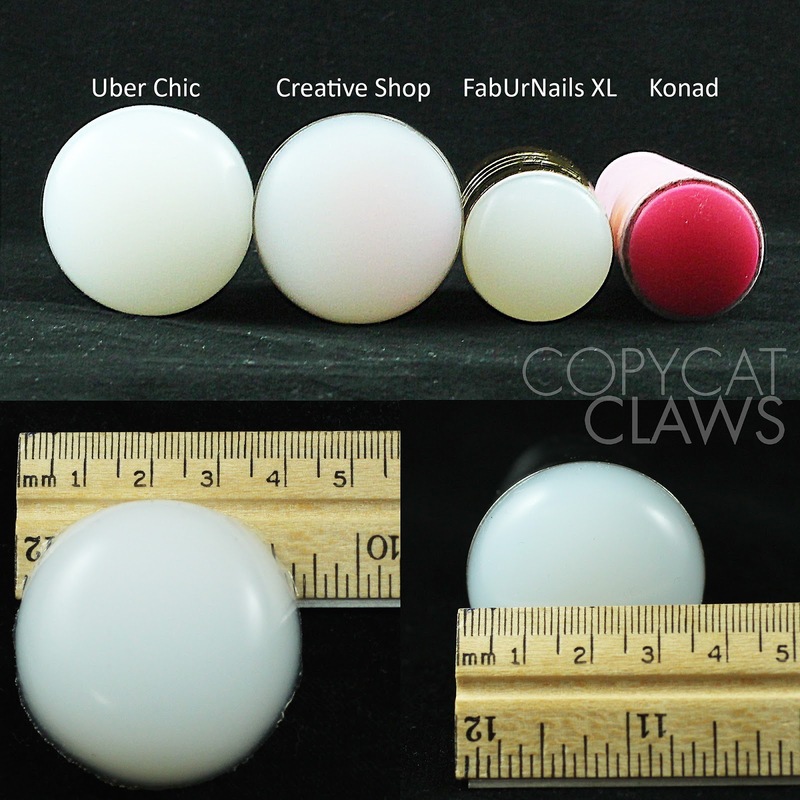 The image I used is from UberChic Beauty 5-01 and the polishes were Mundo de Unas Black or White. 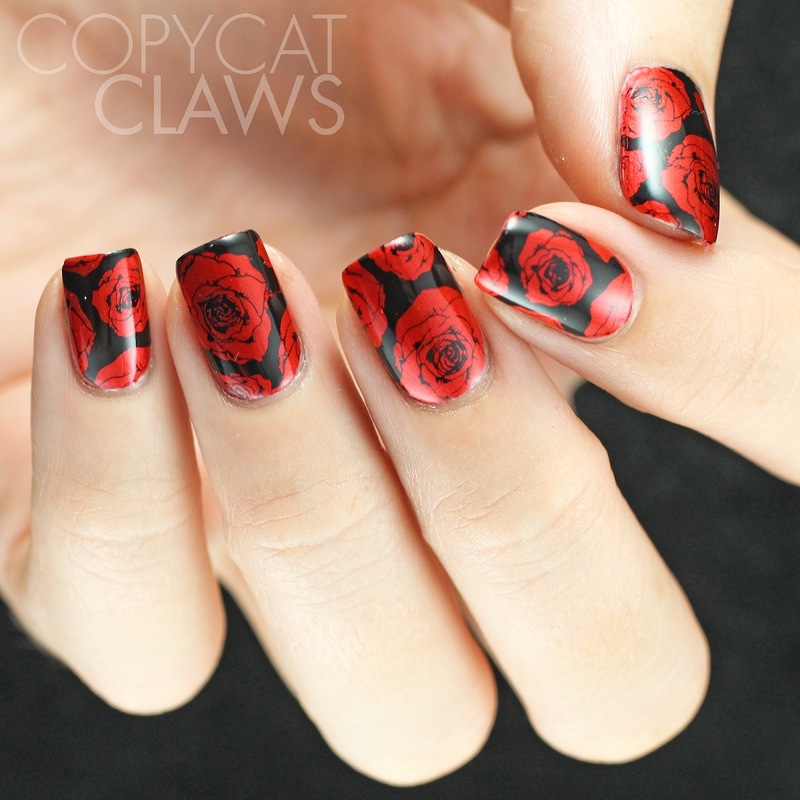 Finally I transferred the same rose image used above onto the nail. 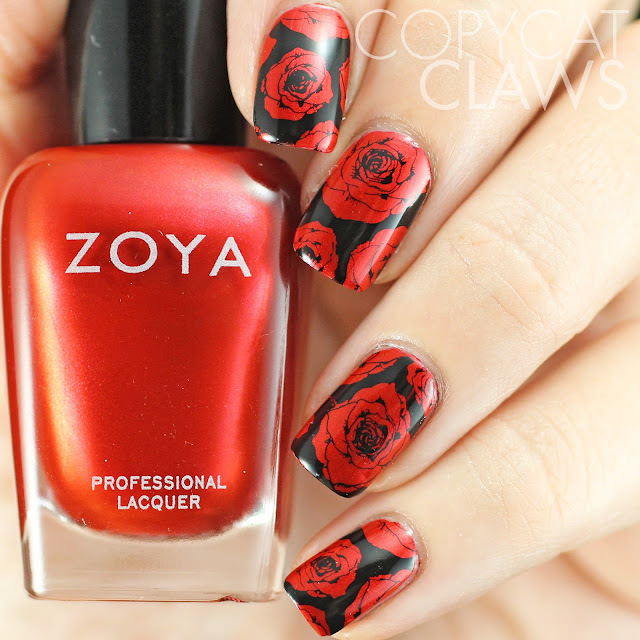 Over a base of Zoya Ember, I pressed the images on using the stamper indicated (index and ring - soft and sticky/ middle and pinky - medium and non-sticky). Both work perfectly. One more final mani shot for good measure of UberChic Beauty 5-01 stamped with MDU Black over Zoya Ember. Since I received these, I've been using them almost exclusively. They really are great stampers, particularly the fact that a dark head is included for when you're stamping lighter colors. 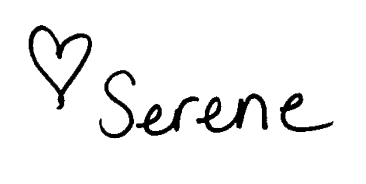 I'm so glad that they're available now and that I could share my thoughts on them with you!